Turning up on a salmon beat with little knowledge of how to use a Spey rod or how fish for salmon is more or less a complete waste of your time and money. For new salmon fishers (or seasoned salmon fishers who want to improve their success ratio) a professional salmon guide is worth their weight in gold. Although most Scottish beat's have a full time ghillie looking after operations it's not always possible that he can spend enough time getting a new fisher going properly when his time is contractually split between all guests (& other daily salmon beat operational duties). With that fact in mind this type of personal guide service is best booked in advance so the angler knows they'll get the required attention levels they need. While anyone can call themselves a salmon guide there's way much more to it than that. The real professionals will have served at least several years on the salmon rivers of Scotland and will know at lease half a dozen beats like the back of their hand. These men will be able to briefly glance at a pool and know instinctively where the fish will be holding and as importantly they'll know the exact tactics required for the best chances of getting hold of a fish. As importantly these guides will be superb hosts and great communicators for teaching all the required fishing skills. Anything short of the above just simply won't cut the mustard and there's no shortcut to acquiring these skills as only time spent on the Scottish river hones these skills to the right standard. 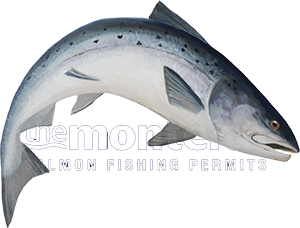 A day to launch a new or struggling salmon fisher correctly into this amazing pursuit with a professional salmon guide is the most effective way forward and especially if they've just gone out and purchased thousands of pounds worth of salmon fishing kit. Sure it's great to be careful with cash but the cost of a professional guide for the day is 'negligible' compared to the loss of the value of expensive fishing kit or the hit from offloading it on Ebay! The professional salmon fishing guide fee portion of a guided salmon fishing day runs typically between £100 & £150 so if you're struggling or brand new to the sport then treating this as an educational cost is wise as you'll be unlikely to experience success without the correct fishing skill knowledge levels. When clients book a professionally guided Scottish salmon fishing day great care and attention goes into selecting the best available salmon guides to look after all fishing guests. In addition to that there's also serious consideration that goes into the salmon beat venue and where the best chances of success will be found although sometimes working that out in advance requires the use of a crystal ball! Make no mistake about the fact that a professional salmon fishing guide who's been selected for the above experience levels will stand you not only the very best introduction to this brilliant pursuit but the very best chance of an introduction to a salmon too!